A panel to support CAT rigs which allows temporary storage and retrieval of a single or muliple poses. Poses are not named and there is no management of them. The idea is that you simply want to grab a pose (or several) and use it immediately, without dealing with names or folder structures for fluid workflow. Poses saved are stored as files and are thererfore persistent unless overwritten using the script store functions. - Supports multiple CAT rigs in the same scene. You can even transfer poses from one rig to another. Finally 3ds max 2015 introduced nested layer and Scene Explorer based new Layer Explorer. I think it is one of the the most important update for years. Of course being the first version. it has some rough edges. I hope this script smooth out the rough edges a little bit. Some of scripts are for old layer manager functionality. Some of scripts are for nested layers. Some of scripts are for frequent user request items. hello this one i wrote just now to clean 3dsmax file the office sent me. It may happen to you that you wanna remove an empty layer that you created before but delete option is grayed out in layer-manager and you no longer able to remove that layer. just remember that 3Ds Max never let you delete a layer while it contain some nodes nor default layer called “0”. but in some rare situations even an empty layer that you created and then you have done with it and want to delete it, but 3Ds Max not let you do that. It’s happen because of some unclassified nodes that came with your imported models from other programs, so you can’t see them in viewport and not in layer manager too. The only way to get rid of them is to select that Nodes from MaxScript and delete them manually so layer’s delete option will back again. 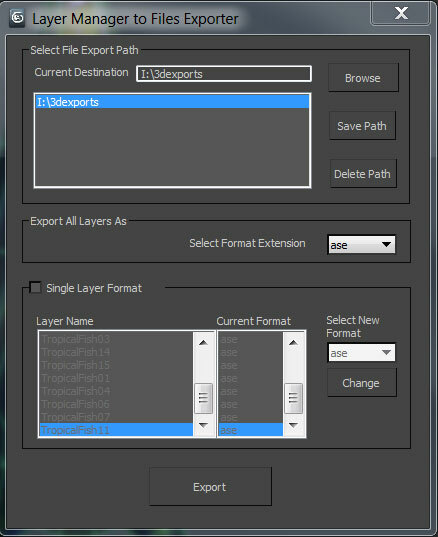 Adds an option to your display quad menu to isolate by layer. Works with your object selection. Hides all layers that none of the objects in your selection belong to. Make sure to select items in the list to see the renaming preview and do the actual renaming! Create nested isolations, go back and forth between them. Hope it helps.